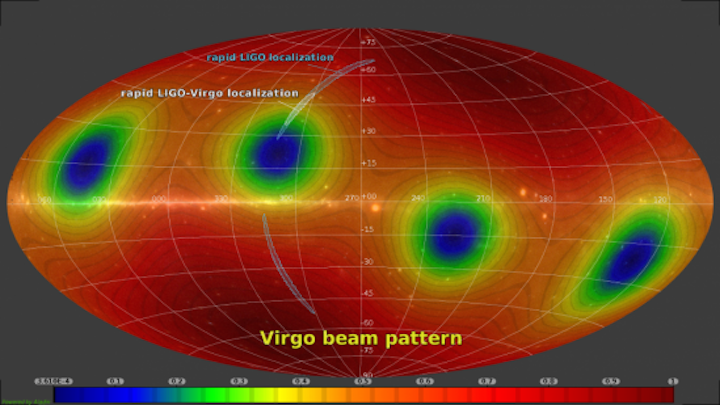 The blue regions show the localization by the two LIGO detectors, and the much smaller white region includes the Virgo network of detectors. Two years ago, scientists from the Laser Interferometer Gravitational-Wave Observatory (LIGO) detected gravitational waves for the first time, proving Einstein’s theory of relativity and his prediction of their existence. The waves were triggered by two black holes colliding. On Aug. 17, 2017, LIGO and the French-Italian Virgo detector observed a completely new class of gravitational-wave signal: a binary neutron star merger. This merger and its afterglow were studied by telescopes spanning the entire electromagnetic spectrum from gamma rays to radio waves. Of fundamental interest to both physicists and astronomers, gravitational-wave observations have ushered in a new era of science. In fact, so many scientific papers about the neutron star merger were published in one day that researchers created an online index to keep track of them. Now, less than two months after that first detection of colliding neutron stars, UC Santa Barbara’s Kavli Institute for Theoretical Physics (KITP) convened a rapid-response program for scientists from around the world, directly supported by the Kavli Foundation. More than 75 physicists and astronomers discussed the astrophysics of the neutron star merger and listened to dozens of presentations that delved into the details of this most recent game-changing event. The August gravitational-wave signal produced the first distance measurement to a nearby galaxy from the merger of two neutron stars and explored the equation of state of matter at super-nuclear densities. Other areas of study also emerged from the profusion of gravitational-wave and electromagnetic data, including the formation of heavy elements as well as the gamma ray burst and other electromagnetic signals that followed the neutron star merger. The cosmic origin of elements heavier than iron has been the subject of much debate. Although theoretical models show that matter expelled in a neutron star merger can form into gold and platinum in a process known as rapid neutron capture (r-process) nucleosynthesis, this latest event provides solid direct observation. For a number of years, physicists and astronomers — many of whom attended a longer KITP program on a similar topic in 2012 — have been modeling what a double neutron star merger would look like. It turns out that many models of these extremely complicated phenomena were uncannily accurate. Another hot topic of the program was the electromagnetic counterpart to the neutron star merger. The gamma ray burst raced the gravitational waves 130 million light-years through the universe to be observed on Earth only two seconds apart. This demonstrated that neutron star mergers are the long-sought origin of gamma ray bursts. It also showed that to extremely high accuracy the speed of gravity and the speed of light are the same, which, according to Brown, rules out a large class of modified theories of gravity. Physicists and astronomers will have another chance to explore gravitational-wave science in a future KITP program slated for 2019. “The New Era of Gravitational-Wave Physics and Astrophysics” will bring together a broad group of experts to discuss the astrophysics and fundamental physics that can be learned from the observations available at that time, which hopefully will be considerable. LIGO and Virgo are updating their instrumentation with the hope that when they come back online in fall 2018 with increased sensitivity, their efforts will yield additional observations of gravitational-wave signals, perhaps from other sources.